Weekend 1 of Coachella just wrapped up and I unfortunately didn’t get to venture out to the desert but wanted to share a festival inspired outfit that could work for a music festival like Coachella or Stagecoach. 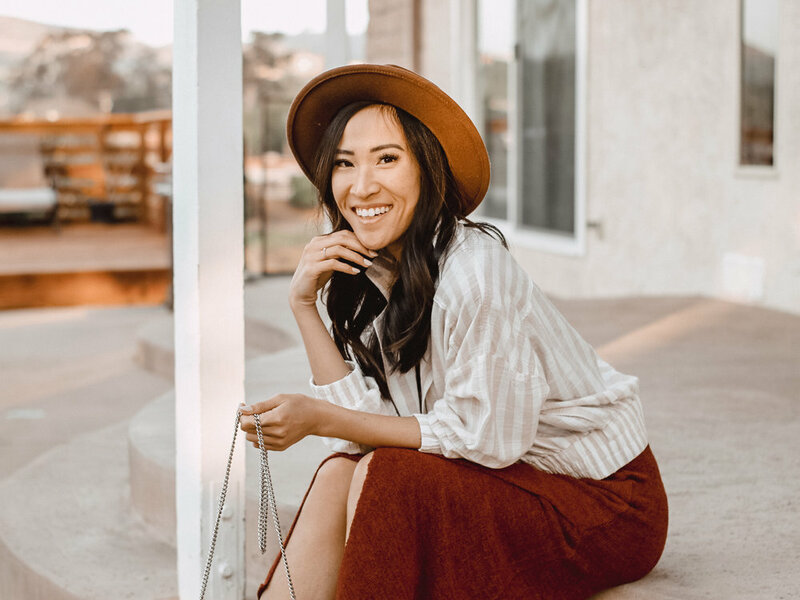 I put together this look while shopping at the Desert Hills Premium Outlets in Cabazon (a little over an hour from OC/LA and about 20-30 minutes from Palm Springs). For this look, I pulled a billowy, striped top over a two piece knit set in this rusty color (from Forever 21) that I am absolutely obsessed with right now. For a boho meets western vibe, I added the felt fedora and cowboy booth mules (from American Eagle) . To avoid carrying around a bulky bag, I completed the outfit with an embellished clutch/wallet crossbody (from Coach). What would you wear to the desert for a music festival? Amanda N Hammond was not given monetary compensation to compose and publish this post, she was originally provided with a giftcard to the Desert Hills Premium Outlets in exchange for Instagram coverage, she publishes this post voluntarily and all opinions expressed are of her own.